Long ago, on an island filled with mana from the Gods, people known as Casters learned to build a prosperous kingdom called Entar. Following a civil war, the great Empire advanced on Entar. Five years later, a young boy named Orville celebrates his 17th birthday and he heads into the village to celebrate. But the Empire's dark grip was tightening on this small community. 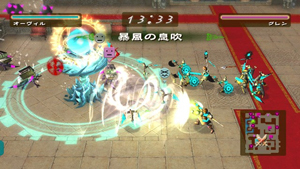 You have to clear each map of enemies by casting spells using your Takt (Wii Remote) to draw Runes on the screen. Over 100 Runes can be learned and used for attack or defense, recovery, changing the terrain, setting up traps, supporting team members or weakening the enemy's stats.